Live image leaks for the Xiaomi Mi Mix 3 are showing no signs of stoppage. We’ve had our fair share of fake ones as well, with sources pretty eager to gauge market reaction for a pop-camera on the smartphone. Xiaomi launched the Mi Mix 2s earlier this year, with a dual camera setup and Qualcomm’s Snapdragon 845. Now, the rumor mill would like us to believe that the company also has the lineup’s next generational upgrade a.k.a the Mix 3 under the works. Take a look below for more details. Today, we’ve got a rather strange leak for the alleged Xiaomi Mi Mix 3. Strange in the sense that there is absolutely no way to authenticate its source. Originating on the aggregator /Leaks, its source is listed as Xiaomi’s ‘xiaomiui’ group on the messaging site Telegram. However, the link is not accessible directly and takes rerouting via several different servers in order to work. More interestingly, the image that’s provided to us today just might be the most authentic in the latest crop of alleged Xiaomi Mi Mix 3 leaked images; several of which are fake. This Xiaomi Mi Mix 3 is in White, which will prove as a popular color variant among users, like its predecessor. At this point in the 2018 smartphone race, Xiaomi should feel the heat from OnePlus, who has managed to gain popularity among its users for attention to aesthetics. Additionally, we all know Xiaomi and it’s inspiration from Apple’s philosophy, which also involves a serious take at a device’s overall look and feel. 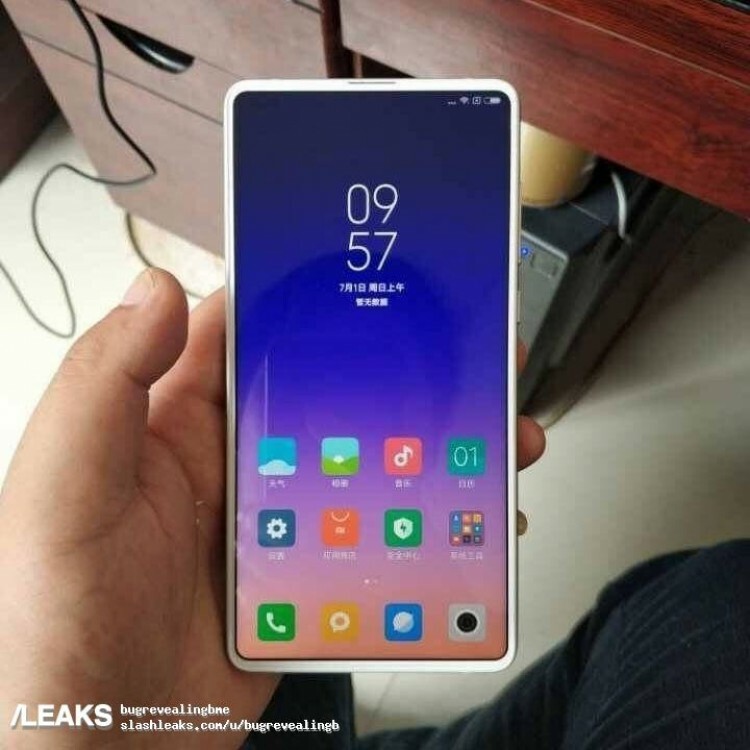 The leaked image once again displays the Xiaomi Mi Mix 3 and it just, just might be the real deal. The play of light on the device is consistent, especially on the bottom, which is an area that is photoshopped most often on these leaks. As the image depicts once again, the Xiaomi Mi Mix 3 will not have any bezels. This will naturally result in a pop camera setup for the smartphone, patents of which have been in Xiaomi’s possession for three years. A pop-up setup is one interesting feature that’s for sure, which will also allay the privacy concerns of some of the more ‘careful’ folks among us. After all, it’s no use to hack a smartphone’s front camera if it’s sitting comfortably in a chamber and not on the top (or as in the case of the Mi Mix lineup, the bottom) of the device. 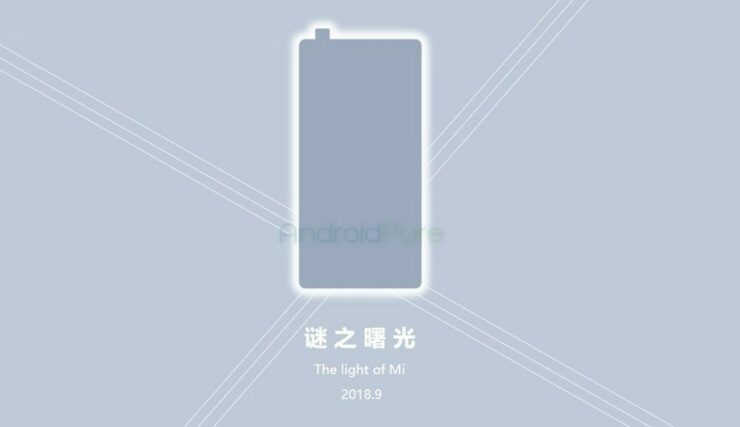 Finally, the White color shows Xiaomi’s obsession with the premium, something which Apple just might abandon on this year’s LCD iPhone 9. The smartphone will feature a variety of color options including ORange, according to KGI’s Ming-Chi Kuo. Thoughts? Let us know what you think in the comments section below and stay tuned. We’ll keep you updated on the latest.